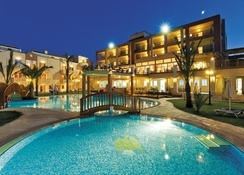 Selini Suites is an upmarket luxury hotel located in Platanias in Crete. The hotel is set against the clear, pristine waters of Mediterranean Sea. The nearest beach is located just 150m away from the hotel. The property houses 2 swimming pools and 1 children’s pool along with a spa and wellness centre. The hotel has 137 well-decorated rooms with elements that guarantee a luxurious sea. The hotel’s proximity to the beach and the towns of Chania and Platanias makes it an ideal destination for someone looking for a beach vacation as well as real Greece holiday. The hotel is located amid the Rapaniana village which allows the guests to experience the peaceful country life in Greece. Located in the village of Rapaniana, Selini Suites is located close to the Mediterranean Sea. The closest airport, Chania International Airport, is 35km away from the hotel. The Heraklion Airport is located at a distance of 161km from the hotel. The closest beach is 150m away from the hotel. The town of Chania is located 20km away from the hotel. Also, the village of Platanias is located 10km away from the hotel. On special requests, the hotel management can arrange for rental cars for their guests for their local excursions and pick-up and drop off the airport at an additional cost. Selini Suites houses 137 tastefully decorated guestrooms, which offer either a sea view, pool view or a tropical garden view. All the rooms come with a private balcony or veranda. The hotel has 6 types of rooms, categorised based on size, amenities and number of guests. Double Room, Family Room, Superior Studio, Apartments, Maisonettes and Villa are the type of rooms offered by the hotel. All the rooms are equipped with all necessary amenities required for a luxurious vacation like Wi-Fi, mini fridge, telephone, etc. Some of the rooms have kitchenettes equipped with necessary equipment for light cooking. Some of the independent guest rooms also have an attached terrace. Selini Suites features a restaurant that serve a variety of Cretan, Greek and International cuisines through the day. The hotel serves American breakfast buffet at its main restaurant along with lunch and dinner. The hotel also houses a main bar and pool bar that serves a variety of local wines and cocktails. The bars of the Selini Suites are known for their creative, signature cocktails prepared by their bartenders. The guests can choose the all-inclusive package while making the bookings.The hotel’s proximity to the town of Rapaniana, Chania and Platanias allows the vacationers to try local eateries and bars. The local beach also has quite a few restaurants, bars and traditional taverns located closely. Selini Suites offers a spa, where the guests can relax and pamper themselves. The hotel also has a pool bar, where one can enjoy a relaxing drink. The swimming pools serve as a great spot for the guests to enjoy pool games or a refreshing dip. The game room at the hotel has board games and puzzles for the kids. The hotel’s proximity to the beach also allows the guests to indulge in water sports at an additional cost. The town of Platanias, which is located about 10km away from the hotel, is popular for its nightlife on the Cretan Island. For the vacationers looking to spend a quiet, leisurely holiday, can relax at the local beach of Rapaniana. Also, one can experience the culture and heritage of Greek by visiting the town of Platanias and Chania. Overall happy with the service, one star less for small food variety. Really friendly staff, clean rooms, comfortable bed, pool was amazing, they even had a quiet pool which I thought was a great idea as they were kids which some people can find a little much as they can be pretty loud, it even had a very relaxing Jacuzzi. They also offered a free massage to everyone which i thoight was very generous. Staff were really helpful and gave us lots of recomendations of places to visit in the country, barman was really fun. Food was good and had a wide variety of options. One thing I would say is the location of the hotel wasn't the best, they were only a few shops and the area was full of dead weeds when you left, the beach that was close to the hotel was also full of dead weeds (loverly clear water though) however this was obviously out of the hotels control. Overall I had a great time and would recomend and visit again.